Shapes Many seeded, smooth, glabrous, globose berry 1–1.5 cm in diameter and borne on 1–2 cm, pedicel thickened upwards. Turkey berry scientifically known as Solanum torvum is also known as Plate Brush, Devils Fig, Pea Eggplant, Bhankatiya, Pea Aubergine, Wild Eggplant, Gully Bean, Tekokak, Susumber, and many other names is native to Central and South America and currently found in India, Africa, China, Thailand, The Caribbean, South America, Indonesia, Florida, Alabama, Brazil, Mexico, Ghana, Jamaica, Papua New Guinea, Puerto Rico (In the high mountains of Puerto Rico they grow thousands of pounds of Turkey Berries), and other places in US and the world. It grows in a wide range of habitats throughout the tropics and subtropics. It grows best in warm moist fertile conditions, but once established it can withstand drought by shedding its leaves. This plant is seen on vacant lands, roadsides, pastures, river banks, and other such areas. Turkey berry is an erect, branched, slender perennial shrub, 2–3 m tall and 2 cm in diameter and is sparingly armed, densely pubescent overall with many- greyish stellate hairs. It is normally found growing in locations with full sunlight and does well in light shade or shade for part of the day, but cannot survive under a closed forest canopy and is quite drought tolerant and is adaptable on a wide range of soils. Root system consists of a deep and strong, woody taproot with numerous woody laterals. Flowering and fruiting starts after the plant reaches a height of 1.5 m. Turkey berry reaches a height of 1.5 m during the year and dies after 2 years. 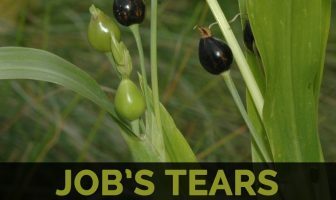 Plant reproduces solely by seed. One to several soft-wooded stems is branched above and is densely covered with fine stellate hairs and is distributed with broad-based, hooked prickles, 3 to 7 mm long. The stems are initially green becoming brown as they mature. Leaves occur singly along the stems and are broadly ovate and 5-20 cm long, usually with seven broad, blunt lobes. Both surfaces are covered with very fine stellate hairs and have dispersed prickles along the main veins. The upper surface of the leaf is darker than the lower. They have finely hairy petioles, 1 to 5 cm long, and vary significantly in shape and size depending on genetic origin and plant vigor. Inflorescence is a dense, compact, branched head consisting of 50-100 flowers at the ends of branches. These occur laterally (between two leaves) as the stems elongate. Each flower has five slender finely hairy sepals 2 to 3 mm long, five white to cream star-shaped petals each about 1 cm long, five elongate yellow stamens and a central stigma. Fruits are actually small, smooth, globular berries 1-1.5 cm across and borne on 1–2 cm, pedicel thickened upwards. Fruit are normally green and scurfy while young that turns into yellowish-green when mature and contain few to numerous flat, round, discoid, woody, often reddish seeds, 1.5 to 2 mm in diameter. Turkey berry normally have spicy flavor and are slightly bitter in taste. Because of its unique taste it is found used in several food items since ancient times till now. The plant is said to have originated from Central and South America, where it is found from Mexico to Brazil and Peru, and is widespread in the Caribbean. Although it originated in the America, it has been spread as a useful plant and thus as a weed throughout the tropics and subtropics. It is now a common pan tropical weed but cultivated as a small-scale vegetable in southern and eastern Asia, and is particularly popular in Thailand and Indonesia. Dr. Paul Haider says; turkey Berries are antibacterial, anti-fungal, and help to stop the excessive cell growth making it significant for cancer. Research show that extract of Turkey Berry can help to protect against lung cancer. So include turkey berry in your regular diet to remain safe from all the life threatening diseases. Diabetes is one of the lifelong conditions that cause a person’s blood sugar level to become too high. Including dried powdered leaves of the Turkey Berry plant to cooked berries help to control diabetes. They are used to lower blood sugar. Therefore regular use of the turkey berry certainly helps to lower the diabetes level. Regular consumption of turkey Berry is considered good for digestion and helps to treat indigestion, stomachaches, diarrhea as well as other digestion related problems. These berries are capable of neutralizing acid in the stomach making them significant for healing gastric ulcers. The berries help to flush out uric acid therefore helping to prevent or reduce pain, redness and symptoms of gout. Apart from that turkey Berry Leaf consists of powerful anti-inflammatory agent and natural steroids called soasoline which is great for arthritis, lower back pain and swelling, and pain in general. Turkey Berries are very important for health since inflammation is the first step towards all diseases. 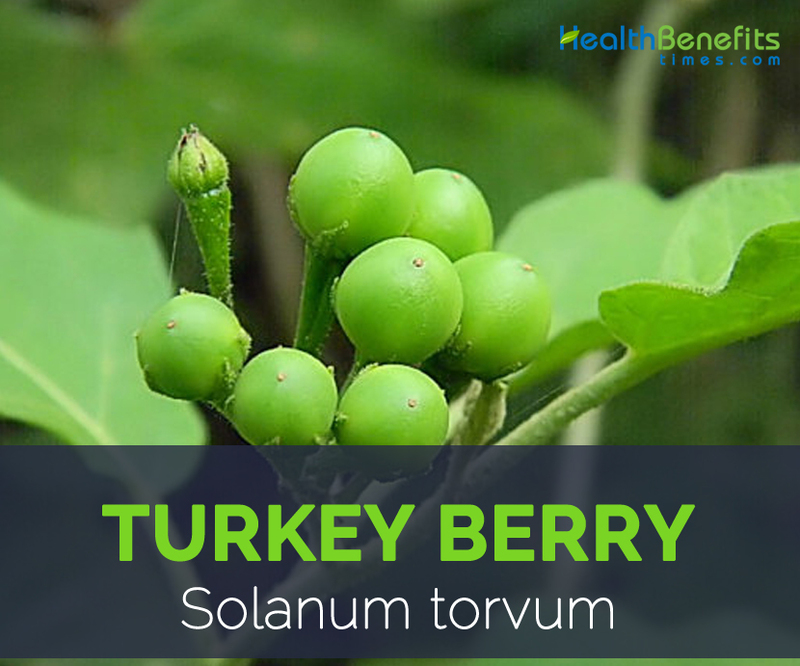 Apart from its health promoting benefits, turkey berries also help in preventing and healing colds and flu. Use the berries to prepare soup and consume frequently to overcome cold and flu symptoms. According to Dr. Haider, research show that the berries can also help to prevent and treat kidney disease and even reverse tubular necrosis and glomerular congestion, thus making it important for treating kidney disease. Other health benefits you can derive from turkey berries are; it is very good for the following. Young immature pale green fruit is used as vegetable. It can be consumed fresh or dip in Namprik (a spicy chili paste with pounded shrimps or dried fish and is equivalent to the Indian sambar or Malay Sambal) in Thailand. Namprik is served as a condiment with rice, meats, vegetables, poultry and fish but can also be served as a dip. Young fruits are also cooked in red or green curry, and the popular Thai dish kaeng kai. Young fruits are used in soups and sauces as are chopped together with eggplant fruits or tomatoes in Ivory Coast. Young fruits are used as lalab, raw or cooked, or eaten in sayor lodeh, a Javanese dish called Trantjam, or the Sundanese Karedok in Indonesia. Young fruit is consumed directly or cooked in dishes like Sundaikkai Sambar, Sundaikkai Poriyal, Sundaikkai Aviyal and Sundaikkai vattral in India, Tamil Nadu. Sundaikkai Aviyali is also esteemed in Kerala cuisine and is a mixture of vegetables including turkey berry (Sundaikkai), curd, coconut and seasoned with coconut oil and Murraya curry leaves. Various part of the plant are utilized in traditional folkloric medicine and have been considered to be analgesic, antipyretic, anti-rheumatic, anti-infectious, diuretic, anti-contusion, anti-inflammation, and antiphlogistic. Plant was used by the Mayans in ancient Mexico to treat rheumatism, infections, vaginal bleeding occurring outside menstrual cycle and as analgesic. Dried roots in decoction, or processed into syrup or alcoholic suspension have been used as treatment for stomach ache, indigestion, gastric pain, amenorrhea and rheumatism in Philippines. Dried pounded roots are used for poultice of cracking sole in Malaysia. Seeds are smoked for curing toothache in Malaysia. Plant is used as antitussive to disperse extravasated blood and to relive pain in China. 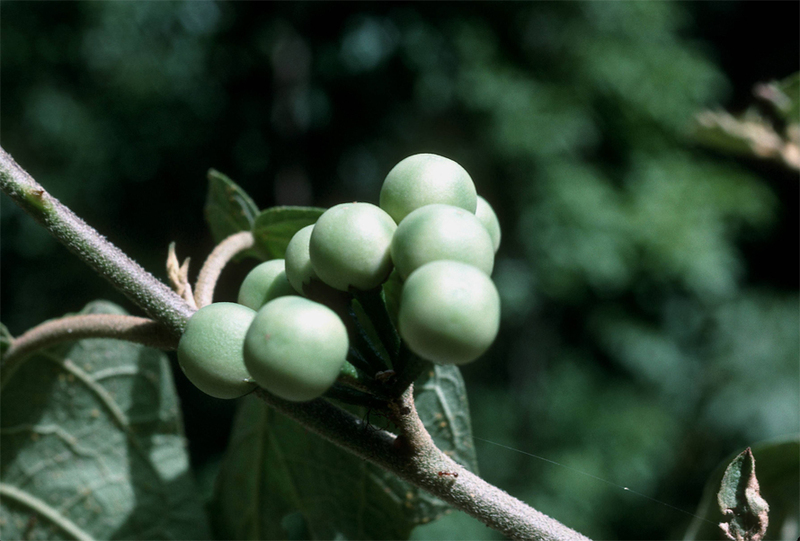 Plant is used as antidote to snakebite and insect stings, the fruit to relieve stomach pain and leaves are dried and ground to powder, which is used as medicine for diabetic patients in India. As an Ayurvedic herb it is used in numerous Ayurvedic treatments along with its sedative, diuretic and digestive properties. It used in the treatment for coughs and cold and a tonic for liver. Young fruits are used therapeutically for improving eyesight; the leaves are used for treating skin diseases – sores, pimples. Plant is used in Cameroonian folk medicine for the treatment of wounds, fever, and tooth decay and for the management of pain and inflammation. Decoction of the fruit is given to children as a cough medicine, and in Senegal the plant is taken to treat sore throat and stomach-ache in Sierra Leone. Fruits are crushed or cooked with dry fish (sidhol) and taken with warm rice to cure rheumatic pain in Tripura and West Bengal. Fruit has been used ethno medicinally as a tonic and haematopoietic, anti-microbial agent and for the treatment of pain. Decoction of fruits is given for cough ailments and is considered as useful in liver and spleen enlargement. Fruit has sedative, diuretic and digestive in action. Antimicrobial properties of the leaves have been known for some time in Central America and India, and also in Gabon people apply the leaves to cuts and wounds. Sundaikkai leaf juice is taken orally to reduce body heat in Tamil Nadu. 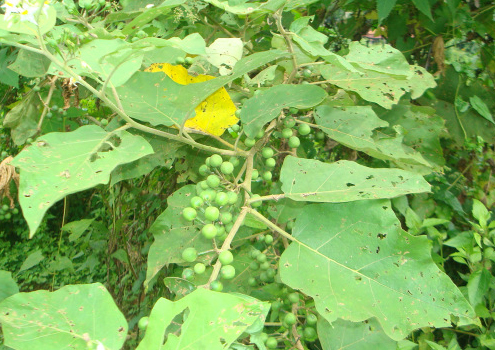 Solanum torvum is used as an herbal remedy for the treatment of malaria in the Dangme West District of Ghana. Leaves are boiled and administered orally. 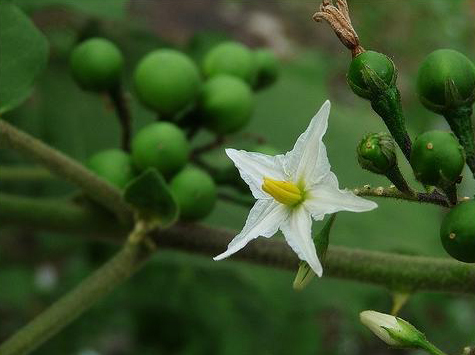 Solanum torvum is used as a disease resistant rootstock against Meloidogyne nematodes for Solanum quitoense in Colombia and Ecuador, and for Solanum melongena in Southeast Asia and Cuba and against bacterial wilt in tomatoes.